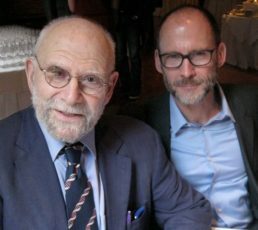 Bill Hayes, author of “Insomniac City: New York, Oliver and Me,” and co-editor of the posthumous collection of essays, “The River of Consciousness” by Oliver Sacks, in conversation with Richard Wolinsky. The author of three previous books, Bill Hayes moved to New York in 2008 following the sudden death of his long-time partner in order to start fresh. After the move, he wound up becoming partners with noted neurologist and philosopher Oliver Sacks (“Awakenings”). This book, published two years after Sacks’ death looks back on their lives together while at the same time taking verbal and visual photographs of random people in New York. Bill Hayes talks about Oliver Sacks, about his career, and about his life was irrevocably changed.